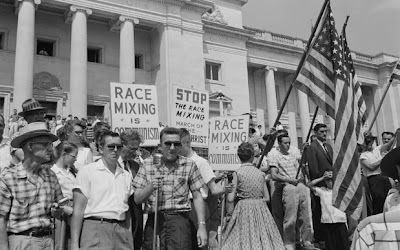 From the UK Guardian, "Alabama clings to segregationist past: US state with racist history votes to keep 'separate schools for white and coloured children' as part of constitution," by Gary Younge, on 29 November 2004 -- During his inaugural address in 1963, the then Alabama governor, George Wallace, took to the steps of the state capitol and made a promise. Standing on the spot where Jefferson Davis had declared an independent southern confederacy just over 100 years before, he pledged: "In the name of the greatest people that ever trod this earth, I draw the line in the dust and toss the gauntlet before the feet of tyranny and I say: Segregation now, segregation tomorrow, segregation for ever." Yesterday it looked as if he might get his wish, after a referendum in the state looked likely to keep segregation-era wording, requiring separate schools for "white and coloured children" in its constitution as well as references to the poll taxes once imposed to disenfranchise blacks. A narrow margin of 1,850 votes out of 1.38 million, or 0.13%, in a referendum on November 2, meant the state was obliged to hold a recount, which took place yesterday. But with no accusations of electoral fraud or any other irregularities, nobody last night expected the result to change. "Separate schools shall be provided for white and coloured children, and no child of either race shall be permitted to attend a school of the other race." And: "To avoid confusion and disorder and to promote effective and economical planning for education, the legislature may authorise the parents or guardians of minors, who desire that such minors shall attend schools provided for their own race ... "
Almost 50 years since Rosa Parks was ejected from a bus in the shadow of the governor's mansion because she would not move to the back, most people thought the amendment to remove the segregation clause would pass fairly easily. "It was more ceremonial than legalistic," said Bryan Fair, a law professor at the University of Alabama in Tuscaloosa. "The language in the constitution was already unconstitutional and this would have brought Alabama up to date. So it was surprising that something so clear and symbolic would be even close." Even the Montgomery Advertiser, not given to radical outbursts, backed it. "Amendment 2 is a valuable cleansing of a grievous stain on the state's image," it argued in an editorial shortly before the vote. "It should be ratified." But powerful groups and personalities on the right campaigned heavily against it, claiming that the amendment opened the door to lawyers to sue the state and raise taxes. They were most incensed by efforts to remove the section that denied that Alabamians had "any right to education or training at public expense". Opponents claim education is a gift from the state of Alabama, not an entitlement. "You open up that door, that is a trial lawyer's dream, to represent clients that have unbridled opportunity for mischief in raising taxes, tampering with private and parochial schools. It's unlimited," said John Giles, president of Alabama Christian Coalition. "Activists on the bench know no bounds. It's a trial lawyer's dream." Mr Giles's campaign was assisted by the former Alabama chief justice Roy Moore, who has become a local hero since he defied a federal court order to remove a two-ton slab of granite engraved with the Ten Commandments from the rotunda of the Alabama supreme court. Mr Giles said he would have been happy to see the racist language go so long as the issue of education rights remained. But many in Alabama believe the taxation argument was simply a ruse for white southerners to flex their muscles, even on a symbolic issue. 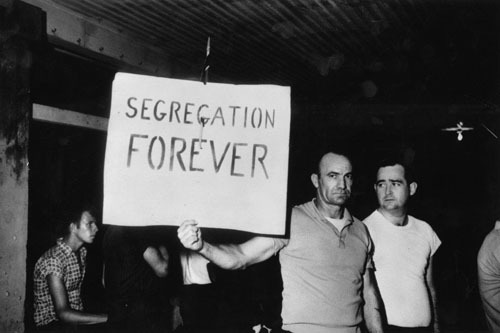 After the US supreme court ordered the end of segregation 50 years ago, many white southerners simply moved their children from state schools to private academies, often referred to as "seg academies" because they effectively kept segregation intact. Since then Alabama has provided the backdrop for some of the ugliest scenes during the civil rights era, from the bombing of a church in Birmingham that killed four little girls at Sunday school to the beating of marchers on St Edmund Pettus Bridge in Selma. "There are people here who are still fighting the civil war," Tommy Woods, 63, a deacon at Bethel Baptist church and a retired school administrator, told the Washington Post. "They're holding on to things that are long since past. It's almost like a religion." A statute banning interracial marriage in the state was struck down only four years ago by 59% to 41%, with a majority of whites voting against the change. This year Mr Moore's former aide, Tom Parker, was elected to the Alabama supreme court even after it became clear that he had been handing out Confederate flags while campaigning and had attended a function honouring the first grand wizard of the Ku Klux Klan. "It seems perfectly clear that a number of the people who voted against the amendment did so for purely racist reasons," said Mark Potok, spokesman for the Southern Poverty Law Centre, an anti-racist monitoring group based in Montgomery. But in one of the most lightly taxed states in the nation the argument that the measure could raise the fiscal burden went a long way, some say. "In Alabama, if an opponent can label a policy as a tax, then 99 times out of 100 the policy fails," said Prof Fair, who is an African American. "Some folks in Alabama are assiduously holding on to what they call southern traditions which are traditions of white people being superior. But racism by itself is far too simple an explanation." · December 1955 Rosa Parks, a black seamstress, was arrested for refusing to give up her seat for a white passenger. Her action prompted the Montgomery Bus Boycott and earned her the title "mother of the modern day civil rights movement". 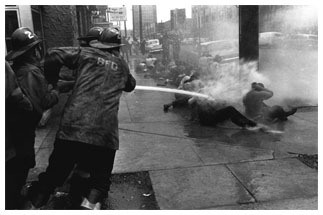 · December 1956 The US supreme court banned segregated seating on Montgomery's public vehicles. The Rev Martin Luther King Jr and Rosa Parks were the first to ride a fully integrated bus. 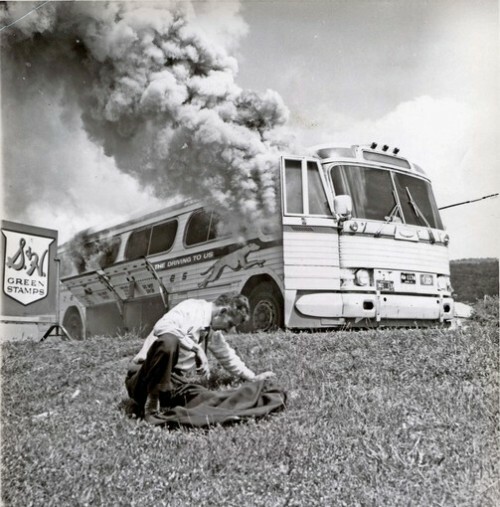 · May 1961 The Freedom Ride, an integrated bus trip from Washington DC, through the Deep South, was formed to test the 1960 supreme court decision prohibiting segregation on buses and trains. It was greeted with violence in Anniston and Birmingham. The Freedom Ride eventually resulted in the interstate commerce commission ruling against segregation in interstate travel. 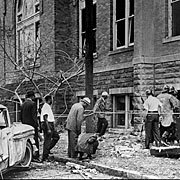 · 1963 Birmingham bombings of civil rights-related targets, including the offices of the Southern Christian Leadership Conference, the home of A D King (brother of Martin Luther King Jr), and the 16th Street Baptist Church (in which four children were killed). 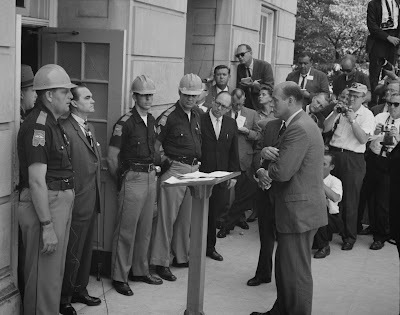 Governor Wallace makes a speech at the University of Alabama protesting against federally forced racial integration; Vivian Malone and James Hood register for classes as first African American students. · March 1965 Six hundred demonstrators make the first of three attempts to march from Selma to Montgomery demanding the lifting of voting restrictions on black Americans. They were stopped by police at Selma's Edmund Pettus Bridge, the pictures of the clashes with police were broadcast across the nation and caused a surge of support for the protesters. · March 1965 The Rev Martin Luther King led 3,200 marchers from Selma toward Montgomery in support of civil rights for blacks. Four days later, outside the Alabama state capitol, King told 25,000 demonstrators: "We are on the move now ... and no wave of racism can stop us." On August 6 1965, President Lyndon Johnson signed the Voting Rights Act into law.